The Western Users of SAS Software 2016 conference is over. I have been to a lot of SAS conferences, but WUSS is always my favorite because it is big enough for me to learn a lot, but small enough to be really friendly. I’m already excited about next year’s conference in Long Beach, September 20-22. If you missed my presentations this year or if you just want a written version, click the links below to download them. SAS Studio: A New Way to Program in SAS presented by Lora Delwiche. Errors, Warnings and Notes (Oh My): A Practical Guide to Debugging SAS Programs presented by Lora Delwiche. SAS Certification As a Tool for Professional Development presented with Andra Northup. This is the best time ever to learn SAS! When I first encountered SAS, there were only two ways that I could get help. I could either ask another graduate student who might or might not know the answer, or I could go to the computer center and borrow the SAS manual. (There was only one.) Today it’s totally different. I am continually amazed by the resources that are available now—many for FREE. This is a wonderful new interface for SAS that runs in a browser and has both programming and point-and-click features. SAS Studio is free for students, professors, and independent learners. You can download the SAS University Edition to run SAS Studio on your own computer, or use SAS OnDemand for Academics via the Internet. Two of the most popular self-paced e-learning classes are available for free: SAS Programming 1: Essentials, and Statistics 1. These are real classes which in the past people paid thousands of dollars to take. You can access hundreds of SAS training videos, tutorials, and demos at support.sas.com/training/tutorial. Topics range from basic (What is SAS?) to advanced (SAS 9.4 Metadata Clustering). If you encounter a problem, it is likely that someone else has faced a similar situation and figured out how to solve it. On communities.sas.com you can post questions and get answers from SAS users and developers. On the site, www.lexjansen.com, you can find virtually every paper ever presented at a SAS users group conference. The site www.sasCommunity.org is a wiki-style compendium of all things SAS. For more tips from SAS Press authors, click here to read them all. SAS Global Forum 2016 is over. Learn where SAS is now and where it’s going including cloud computing with SAS Viya in a short and sweet 5 minute summary. Huffington talks about the importance of a good night’s sleep for doing our best. This is the full presentation. McCandless is an amazing graphic artist of data. This is the full presentation. The heart of SAS Global Forum has always been papers by SAS users for SAS users. This year more have been recorded than ever before. For me, a major highlight of SAS Global Forum 2015 was seeing Matthew Slaughter’s presentation, Sending Text Messages from SAS. You may have noticed that his name is similar to mine. This is not a coincidence as he is my son. However, this paper was his idea. He researched the topic on his own, and wrote the paper by himself. In his presentation, he described two ways to send text message from SAS. The first uses a FILENAME statement and DATA _NULL_ to send a text message via the email-to-SMS gateway. The second uses an X command to send a text message via Amazon’s Simple Notification Service. To download his paper click here. I recently returned from SAS Global Forum where Andra Northup and I presented an updated and expanded version of our paper “SAS Certification as a Tool for Professional Development.” You can read our paper here. SAS certification has been around for a while. The first SAS certification exam was offered way back in 1999. So it’s fascinating to me that the program is currently growing in leaps and bounds. Over 80,000 SAS certification credentials have been awarded and 13,383 of those were in 2014 alone. The SAS certification program has experienced double-digit growth for the last five years. I have a suspicion that technical certifications are growing in popularity in general, and that SAS’s certification program is riding that wave. Over the last six months, I have begun to see job postings specifically asking for Base SAS certification. This is totally new! Of course, certification alone is not enough to get you hired or promoted as a SAS programmer, but it can help. For more advice about how to prepare for, register for and take SAS certification exams, see our paper. We wish you the best of luck! If you had told me a year ago that I would write a paper about SAS certification for the Western Users of SAS Software 2014 Educational Forum and Conference, I would have been very surprised! I became a SAS Certified Professional long ago, and that certification expired–long ago! However, in the past six months, both my son and a friend have become SAS certified. In the process, I learned a lot. Over 67,000 SAS certificates have been awarded. The volume of tests taken has doubled in the past three years. The first SAS certification was in Europe and required passing 3 two-hour exams. Since 2006, certifications no longer expire, but are tied to a particular version of SAS. Some people claim that the Advanced exam is easier than the Base exam. The pass rate for the Advanced exam is, in fact, higher than for the Base exam. At only $55, the online practice exam for the Base exam is a bargain, and it’s good for six months. The SAS Programming 1: Essentials online self-paced course is FREE. If you are going to the conference, I hope you will attend our presentation Thursday, September 4, 2014 2:00-2:50pm. If not, then you can download the paper here. New with SAS 9.2, ODS Graphics introduced a whole new way of generating graphs using SAS. With just a few lines of code, you can create a wide variety of high-quality graphs. This workshop shows how to produce several types of graphs using PROC SGPLOT, and how to create paneled graphs by converting PROC SGPLOT to PROC SGPANEL. This workshop also shows how to send your graphs to different ODS destinations, how to apply ODS styles to your graphs, and how to specify properties of graphs, such as format, name, height, and width. If you are going to the conference, I hope you will attend my workshop Thursday, September 4, 2014 4:00-6:00pm. If not, then you can download the paper, step-by-step handout, and syntax reference tables. SAS Global Forum 2015 Here I Come! 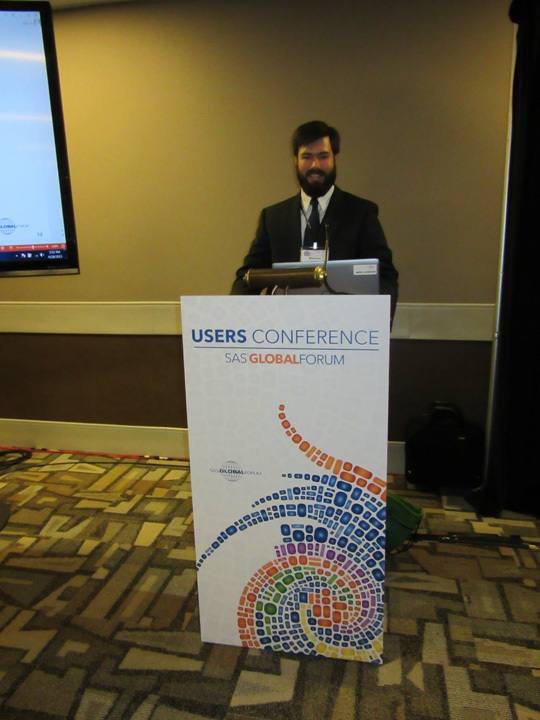 I first attended SAS Global Forum (then called SAS Users Group International) way back in 1987. Since then I have attended as often as possible. Unfortunately, 2014 is not one of my years. I will not be there in Washington DC March 23-26, 2014 to hear the great presentations, or learn about exciting new features from developers in the Demo Room, or see the many friends I have made over the years. You can be sure that when March 23 comes, I’ll be hanging out in front of my computer to catch the Opening Session and any other live-streamed events I can glean. Since I can’t be there this year, I’m already looking ahead. I plan to be in Dallas next year for SGF April 26-29, 2015. I might even make a presentation or two. I’m already trying to figure out possible topics for a paper or panel. So I was intrigued when I heard a segment on the public radio program Marketplace about this very issue. They have developed a Panel Generator to invent promising session topics for you. Here’s the link. Just click the Pick a Panel button, and they will create an original topic just for you. Let me know if you’d like to hear me talk about any of these topics at SGF 2015, and I’ll try to figure out what they are.